Read about my research for the book. The world would not have Vincent van Gogh’s art without his brother Theo. The brothers’ friendship was stormy, passionate enduring, essential, a work of art in itself. For the past five years I immersed myself in the lives of Vincent and Theo van Gogh. Drawing mostly on the 658 letters from Vincent to Theo, and the 40 we have of Theo’s to Vincent, this book tells the story of two dramatic lives intertwined. Winner of the 2017 Nonfiction Boston Globe-Horn Book Award! Read the acceptance speech. Vincent and Theo was Book of the Week at Cooperative Children’s Book Center. Bookish says Vincent and Theo is one of Spring 2017’s Best Young Adult Books! PW Picks: Publishers Weekly Books of the Week, April 17, 2017. PW Daily: Publishers Weekly Review of the Day, April 19, 2017. Walking and Talking With…Deborah Heiligman, Steve Sheinkin’s regular series of conversations with writers for youth. Brotherly Love with Deborah Heiligman, a Kirkus interview by Julie Danielson, who also blogs at Seven Impossible Things Before Breakfast. Happy National Siblings Day! 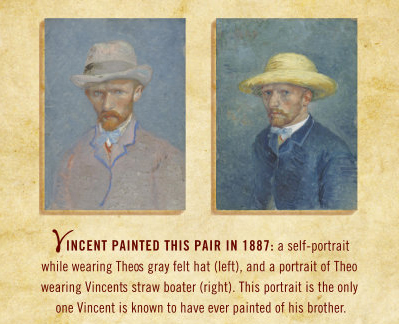 In which I write about the van Gogh brothers, my siblings, my sons, and my fake twin. Interview on Clara Gillow Clark’s blog. Omnivoracious interview: Deborah Heiligman on Vincent & Theo. Listen to a Meet-the-Author Book Reading on teachingbooks.net. 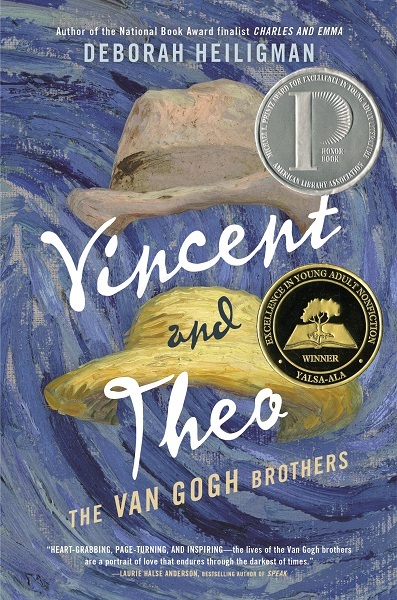 Read School Library Journal’s article: Vincent and Theo: A Conversation with Deborah Heiligman. Listen to “Creativity: Life From the Inside Out“, a WHYY program featuring Deborah and others exploring the role of psychology in creativity through the lives of artists. From Publishers Weekly: Vincent and Theo: A Q&A with Deborah Heiligman. From reviewer and librarian Karen MacPherson at Children’s Corner: Brotherly Love. From the Champaign, IL News-Gazette: An eloquent story about the Van Goghs. “Without Theo, there likely would have been no Vincent van Gogh as we know him. While other books and movies have taken on these curious and impassioned brothers, Deborah Heiligman’s impeccably researched biography hits all the right marks…Complete with a family tree, timeline and detailed bibliography, it’s unlikely a more thorough biography of the artist and his family could be written, especially for this age group.”—Bookpage Read the full review. “Deborah Heiligman was a National Book Award finalist for her marvelous biography “Charles and Emma” for young readers, and she brings the same original perspective, artistry, meticulous research and love for her subjects to this ambitious, heart-wrenching, stunning biography of the Van Gogh brothers.”—Buffalo News Read the full review. “Deborah Heiligman has written an extraordinarily creative biography. Not only does Vincent and Theo portray the van Gogh brothers’ close personal affinities, it also mirrors their convergent artistic visions. Heiligman’s prose, her syntax and diction, her imagery, even the design of her book all reflect Theo’s impressionistic enthusiasm and Vincent’s bold chiaroscuro palette. Reading Vincent and Theo is like walking through an intimate gallery of late nineteenth-century art.”—Bookin’ with Sunny Read the full review.